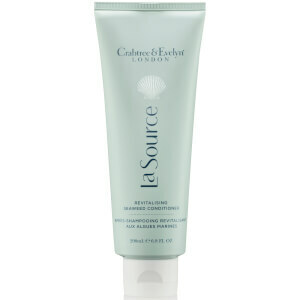 Replenish and revitalise with the Crabtree & Evelyn La Source Conditioner; an ultra-hydrating formula with a soothing fragrance of aquatic notes, musk and gentle shoreline breezes. Fortified with Sea Kale and antioxidant-rich Green Seaweed Extract, the weightless conditioner moisturises and protects hair, whilst banishing knots and tangles for a smooth, sleek finish. Expect nourished, rejuvenated locks with enhanced shine from root to tip. Apply to freshly cleansed hair after shampooing. Lather, then rinse. Water (Aqua)(Eau). Cetearyl Alcohol. Hydroxypropyl Starch Phosphate. Polysorbate 60. Enteromorpha Compressa Extract. Crambe Maritima Leaf Extract. Behenyl Alcohol. Behentrimonium Methosulfate. Fragrance (Parfum). Silicone Quaternium-18. Cetrimonium Chloride. Bis-Peg-18 Methyl Ether Dimethyl Silane. Caprylic/Capric Triglyceride. Deceth-7. Trideceth-6. Disodium Edta. Glycerin. Cocamidopropyl Betaine. Dipropylene Glycol. Citric Acid. Sodium Hydroxide. Benzyl Salicylate. Limonene. Eugenol. Magnesium Nitrate. Phenoxyethanol. Methylchloroisothiazolinone. Magnesium Chloride. Methylisothiazolinone. Potassium Sorbate. Sodium Benzoate.